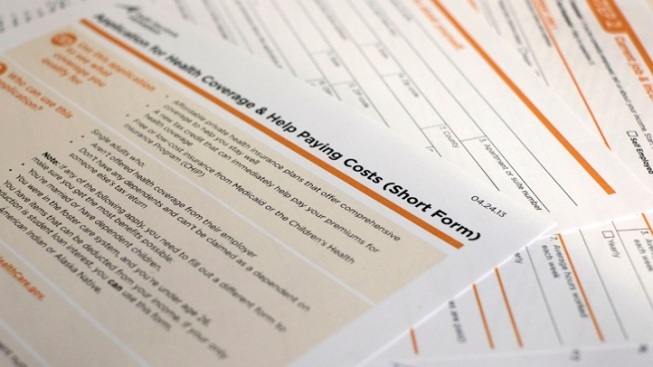 This application obtained by The Associated Press shows the short form for the new federal Affordable Care Act. The Affordable Care Act offers the self-employed the flexibility of getting health insurance, but the cost could become a burden for those who make too much money for government subsidies, but not enough to be considered well-off. Experts say the young, single and self-employed may decide not to get health insurance and pay the penalty. The ACA will likely provide freedom to those who want to pursue entrepreneurial ventures and had once felt tied to employer-based coverage. Click the link above for a case study of a Texas family whose health costs would go up if they sign up for health insurance under the ACA. The Wolf family's annual income is too high, making them ineligible for government subsidies. According to the Kaiser Family Foundation's online calculator, the family's health care costs could double if they purchase a benchmark plan through through the federal exchange. Assume their annual income is $130,000, the family would pay an annual premium of $14,804 for the mid-range, Silver Plan. Their current premium is about $7,800. Florida issued an order banning "navigators" or counselors hired under the ACA to help low income, uninsured people sign up for health insurance. A Florida health department spokeswoman said that navigators were not acting on behalf of the state's health department, citing that the ACA program raised privacy concerns due to consumer information that will be gathered in a federal database. Federal representatives said the claims were "unfounded," and suggested it was an attempt to thwart the ACA, despite having the second-highest uninsured population in the U.S.